The Taiwanese delegation spent their first night in Belize City on Thursday, August 16th, and spoke at a scholarship award ceremony at the Cahal Pech Room inside the Radisson Fort George Hotel. Later in the evening, she visited the Museum of Belize, where she was conferred with the Order of Belize by Governor General His Excellency Sir Colville Young. The following day she attended the Special Sitting of the House of Representatives in the Capital City as part of her itinerary. She addressed the House, speaking on the strong ties between Taiwan and Belize. “I want to emphasize that despite the great geographic difference between our two countries, Belize remains close to our hearts,” said Wen. “The Republic of China (Taiwan) is committed to supporting the national development of Belize as a friend and partner. We believe in the great potential of the Belizean people and all that you are destined to accomplish” Wen praised Belize for being an outspoken supporter for Taiwan before the international community and recognizing the Asian nation as a sovereign State. Prime Minister Right Honourable Dean Barrow, welcomed President Wen to the House and told her on behalf of all Belizeans, that he was pleased with her visit. “We consider it an honor that you have graced us with your presence and we are positive that this is a sign that the already robust relations that existed between our two countries are stronger,” said Barrow. 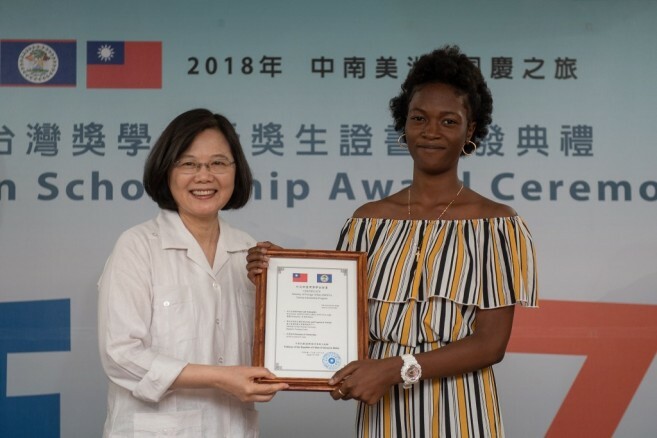 Taiwan via, its International Cooperation Development Fund, has been able to assist in Belize’s growth as a country in areas of human resources development that play a vital role in assisting its allies to achieve sustainable development. Education is also a crucial mechanism for training workforces in developing countries. Belize’s Minister of Education, Honourable Patrick Faber stated that partnership with other countries that gives Belize a gift towards education is one to be appreciated because it is a gift that never is taken back. “The best gift is the contribution to education,” said Faber. 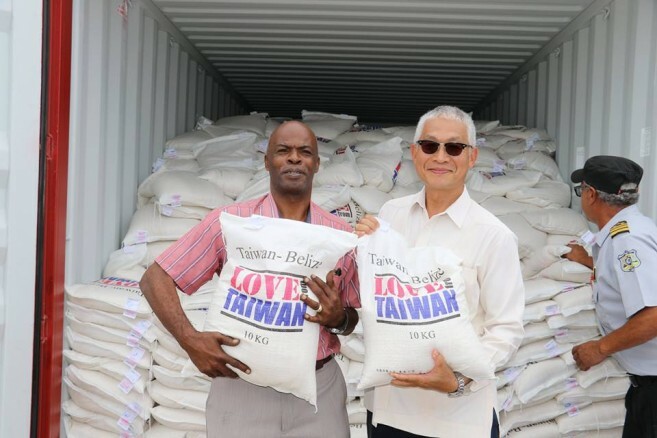 The Ambassador stated that the donation was possible due to the bountiful harvest of rice in Taiwan, thus, the Taiwanese Government was happy to share with those in need in Belize. “Each bag is ten kilos, so that means one hundred thousand kilos of rice is here. I know that the rice cannot feed all the people in Belize, but at least we can feed some people in need,” said Liu. In his remarks, Minister Martinez thanked Taiwan for its generosity and stated that the rice would be distributed to over 800 governmental and non-governmental agencies and families as well. The recipients of this donation include clients of the Ministry of Human Development, the Ministries of Health, National Security, the National Emergency Management Organization, Kolbe Foundation, the Inspiration Center, Helpage, Hand in Hand, Mercy Clinic, Salvation Army, the Mental Health Resource Center, and VOICE, a representative organization for older persons in Belize. Also benefiting from the rice will be various school feeding programs and children’s homes. The rice donation is estimated at a value of $125,000 US dollars, and its distribution will start as soon as Customs clears it. 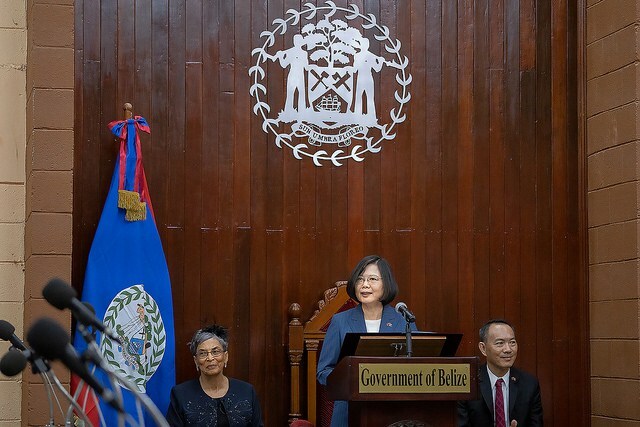 Belize is one of 17 countries around the world that officially recognizes Taiwan as an independent country. In recent years, Taiwan has been losing support from other countries, with Panama, and the Dominican Republic is establishing relations with China. On Tuesday, August 21st, news broke out that El Salvador also cut ties with Taiwan and had immediately established relations with China. Salvadoran President, Salvador Sanchez Ceren announced the rupture, saying there are extraordinary opportunities with China. Taiwan’s Foreign Minister, Joseph Wu responded that El Salvador had recently asked for loans for a port project, which Taiwanese engineers concluded was economically unfeasible. Wu also denounced China for trying to convince other countries to stop supporting Taiwan’s Government.